Even before meetings began, facilitators of the multi-stakeholder group convened in Falmouth to address widespread neighborhood complaints about noise from two town-owned turbines realized that the original goal of having group develop a consensus recommendation was too high a bar to aim for. So, the process was dubbed the “Wind Turbines Options Analysis Process,” with a hope of being able to present two or three options to the Selectmen for consideration before this spring’s Town Meeting. As it turns out, even that goal was elusive; in the end, the WTOP report summarizes four options, which generally reflect the initial stances of various stakeholder groups: take them down (the unwavering stance of the affected neighbors), run them at full power (the preference of the climate action groups in town and of those representing the town’s budgetary interests), or settle for one of two options involving shutting them down for all or part of the night (which satisfies neither the neighbors nor the climate or fiscal constituents). In all three of the options that will cost the town money (removing turbines and replacing a third to half of their capacity with solar panels, running them full-time and compensating neighbors, and shutting them down for 12 hours each night), the WTOP recommended that the town seek funding from the state to support the initiatives. UPDATE, 1/30/13: The Falmouth Board of Selectmen voted tonight to recommend that the two town-owned turbines be dismantled, and for the town to ask the state for funding to help cover the town’s debt for the turbines, and for the MassCEC to forgive the town for Renewable Energy Credits previously purchased as part of the project financing. The Selectmen will prepare a warrant article for the April Town Meeting, likely to be followed by a town-wide vote in May. A few things stood out for me as I read through the 55-page report and some of the supporting materials (available at this link). Although most of the discussion of acoustic measurement centered around whether, where, and how often the turbines exceeded DEP guidelines, most members of the WTOP acknowledged that operation within these guidelines would still not result in acceptance of the turbines by affected neighbors, since neighbors stated that compliance with the guidelines did not alleviate the health concerns they experienced. In keeping with this understanding, the section of the report fleshing out the option of running the turbines at full capacity includes several measures meant to provide compensation for nearby neighbors; while brief, these options include purchasing (and reselling) homes, providing financial compensation that neighbors could use as they see fit (sound insulation or masking equipment, pay utility bills, etc. ), and the possibility of the town offering a Property Value Guarantee. A unique feature of the WTOP group was that it included two members whose charge, unlike all the other stakeholders, was to hold “multiple perspectives;” in essence, their task as individuals was to synthesize all the information, much as the group as a whole would ideally do. With the group unable to find a synthesis of its own, the conclusions of these members are especially valuable. In December, four acoustic consulting firms collaborated to study wind turbine noise at three Brown County, Wisconsin homes that had been abandoned by their owners after the nearby Shirley Wind Project began operations. The study, organized by regional environmental group Clean Wisconsin and paid for by the state Public Regulatory Commission, will help inform the PRC’s consideration of a proposed new wind farm in the area. Two things stand out about this new study. The first is the choice to bring together several acousticians who have previously been widely cited by opposite sides of the turbine siting debate. The study team included one firm (Hessler and Associates) commonly hired to do sound assessments for wind developers, another (Rand Acoustics) that has become widely championed by concerned citizens groups because of its much more cautionary assessment of turbine noise, and a third (Schomer and Associates) whose work has often been in the middle ground, with particular papers being seized on by each side in the siting debate; the fourth firm (Channel Islands Acoustics) has worked much less on wind farm issues than the other three. This diverse group of acousticians produced a 13-page consensus report (edited to 12 pages in the final version submitted to the PSC), along with an appendix report from each team, all of which focus on different aspects of the study that they found most compelling. The four investigating firms are of the opinion that enough evidence and hypotheses have been given herein to classify LFN and infrasound as a serious issue, possibly affecting the future of the industry. It should be addressed beyond the present practice of showing that wind turbine levels are magnitudes below the threshold of hearing at low frequencies. In particular, the research team agreed that a further literature search for studies related to vibration-induced nausea should take place (Paul Schomer is working on this), and that a “threshold of perception” test should be conducted, to see what proportion of residents are able to perceive the faint signals in either audible or infrasonic ranges. Only one of the five acousticians, Rand, could detect sound at all residences; he also reported headache and/or nausea (it is also noted that he is the only one among the five researchers who suffers from motion sickness). In the wake of NOAA’s large-scale ocean noise mapping project, two much more detailed studies from the Pacific Northwest have highlighted the likelihood that current shipping noise is already pushing the limits of what biologists think many ocean creatures can cope with. The first study recorded the sound from several types of boats and ships traversing Admiralty Inlet, between Whidbey Island and Port Townsend, WA, and used these recordings, correlated with ship traffic records, to model sound levels throughout the area. The Seattle Times summarizes this work, which found that at least one large vessel (container ship, ferry, or large tug) was in the area at least 90% of the time, and that the average noise level was about 120 decibels, which is the threshold above which federal agencies begin being concerned about behavioral impacts on some ocean species. But now, check out that lighter colored patch about halfway between BC’s two big offshore islands. That’s an inland waterway that heads up to Kitimat, the proposed site of a major new port, the Northern Gateway, which would serve as the primary port for shipping tar sands oil to Asia. An annual total 220 super-tankers would head though that currently mostly-yellow zone, all the way up that long, narrow channel that points to the upper right hand corner of this close-up (and leave again—so more than one passage a day on average). As you might imagine, there is widespread concern about the risks of accidents and spills in these often treacherous passages, but the increase in shipping noise is also being raised as a question. A second study by the same research team, led by Christine Erbe, took a close look at current and likely increases in shipping noise, should Northern Gateway go forward, and what they found is not reassuring. Noise levels will increase by up to 6dB in the approach lanes in Caamano Sound, and by 10-12dB in the narrow fjord into Kitimat (see map on right). 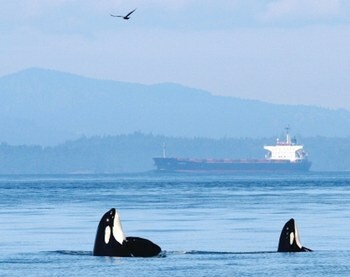 In the western channel (the wider approach), where sound would likely increase 3-6dB (representing a doubling to quadrupling of sound energy), Humpbacks would hear tankers and their accompanying two tugboats for 43% of daylight hours, and orcas (due to thier higher-frequency hearing, less intruded upon by low-frequency ship noise) would hear the tankers 25% of the time. Fewer whales venture all the way up the fjords, but some would likely be present in the bend in the route, where noise levels would increase by 10dB, representing a 10-fold increase in sound energy. These studies, one of which utilized four seasons of recordings, and the other presenting a comprehensive and verifiable sound modeling approach, both offer exciting steps forward in the study of coastal and oceanic acoustic habitats. Let’s hope that coming years produce many more studies from other regions around the world that continue to develop these innovative techniques. Detailed Northern Gateway study: Erbe, C., Duncan, A., and Koessler, M. 2012. 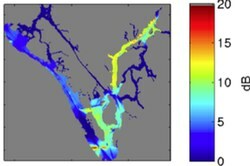 Modelling noise exposure statistics from current and projected shipping activity in northern British Columbia. Report submitted to WWF Canada by Curtin University, Australia. BC sound modeling study: Erbe, C., MacGillivray, A., and Williams, R. 2012. 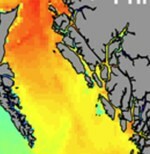 Mapping Ocean Noise: Modelling Cumulative Acoustic Energy from Shipping in British Columbia to Inform Marine Spatial Planning. 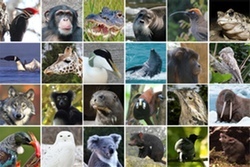 Report submitted to WWF Canada by Curtin University, Australia. Shorter version: Erbe, C., MacGillivray, A., and Williams, R. 2012. Mapping cumulative noise from shipping to inform marine spatial planning. J. Acoust. Soc. Am. 132 (5), November 2012. 423-428. Ambient sounds of the space station! Here’s a taste of his recordings; see the CNET link above, or this Soundcloud page, for many more. Boston’s WBUR recently interviewed Jesse Ausubel, of Rockefeller University and Woods Hole Oceanographic Institution, about an ambitious project dubbed the Quiet Ocean Experiment. The idea is to dedicate a year to making detailed observations of wildlife responses to temporary reductions in normally noisy ocean activities, and ideally, to spur a period of several hours to a day during which nearly all human activity in the oceans might cease, in order to see what effect that may have. Rather than studying the impacts of new noise sources, Ausubel and his colleagues hope to see what removing sound might do. 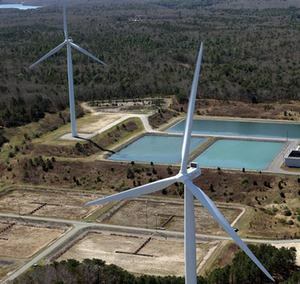 Eastern Massachusetts continues to be a hotbed of both small-scale wind development and ongoing complaints in several towns. Sixteen communities in the area now host one to four wind turbines (not all of which are full-sized industrial turbines); in five of these towns, complaints have been relatively numerous (a dozen to several dozen individuals). Some of the turbines are owned by towns, generally to power a portion of town-owned facilities, and some are owned by businesses, for their own power, or by private wind developers. Timbertop Wind has asked the New Hampshire state Site Evaluation Committee (SEC) to assume jurisdiction over a proposed 5-turbine wind farm that straddles the town line between Temple and New Ipswich. The SEC always has jurisdiction over projects of 30MW or more; the Timbertop project is only 15MW, so the SEC will decide later this winter whether to get involved. The request came in part due to some differences between the Temple and New Ipswich siting regulations, though the primary concern noted by by Adam Cohen of Timbertop is the noise limits imposed by 2012 ordinances passed in both towns, which set a maximum noise level of 33dB on non-participating neighbors’ property. “While the ordinance originally adopted in New Ipswich in 2010 was reasonable, the ordinances as adopted in New Ipswich and Temple in 2012 impose substantive requirements inconsistent with SEC precedent and state law,” Timbertop’s recent application to the SEC states. In some other rural towns, noise complaints become more common as sound levels top 35dB, with sound levels of 40-45dB creating significant community annoyance. The 33dB limit appears to be an attempt to greatly minimize the chance of serious noise issues for any neighbors, though turbines may still be slightly audible on some nights; see this recent post on noise studies in Woodstock, Maine, with noise levels at about what would be allowed under this ordinance. See this detailed article in the Monadnock Ledger-Transcript for more.